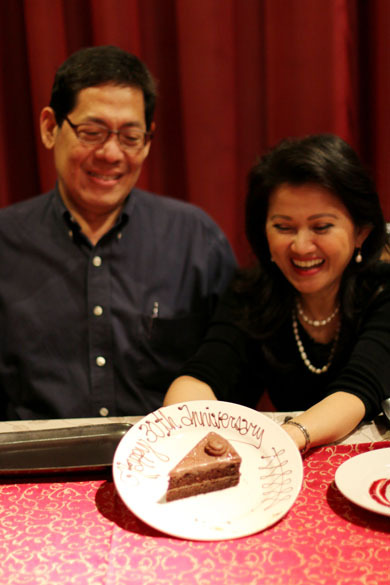 Two weeks ago, our parents celebrated their 30th anniversary. 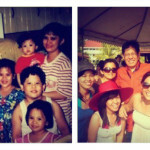 Because it was a very special occasion for the family, my siblings and I prepared two surprises for them that day. 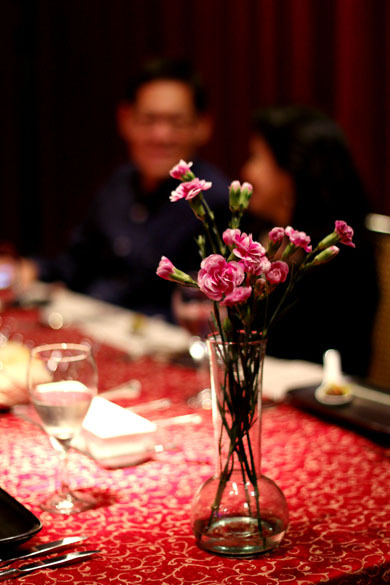 The first one was an invitation for our parents to have dinner with us at 22 Prime (Discovery Suites), one of the best steak restaurants in Manila. While, the second surprise was an email account filled with greetings and messages from more than 100 people, including family and friends. Yay! We usually don’t eat at hotels because of our budget. But, every now and then, it’s fun to try something new with the family. 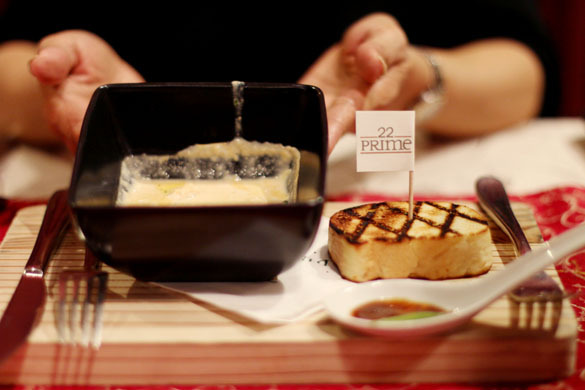 When we arrived at Prime 22, the staff warmly welcomed us and guided us to our table. They even offered to pull and push our chairs as we sat down. Love it! The place had dim and soft lights all over the place which helped create a cozy and relaxing atmosphere. Throughout the whole night, the waiters also stood nearby and attended to our requests. Even without us asking, they re-filled our glasses with cold water – a simple and thoughtful act that I truly appreciate as a customer whenever I dine out. Moreover, while waiting for our main dishes, we were given two, refillable baskets of complimentary bread with spreads. The spreads offered were: Herbed butter, Feta Cheese in Olive Oil, and Sun Dried Tomatoes. LOBSTER BISQUE (Php 395) – Fresh lobster, micro greens, and tomato herb croutons. Although this soup was a bit salty for me, it still had a rich seafood taste and was very smooth and creamy. 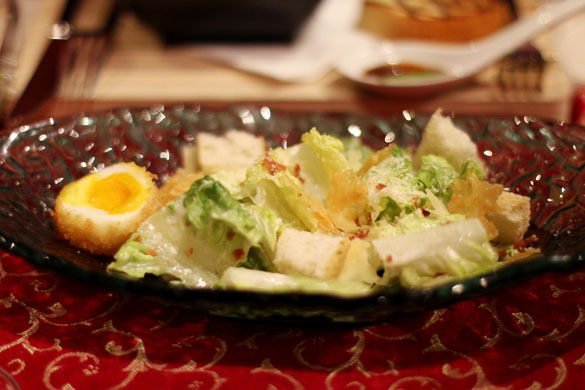 PRIME CEASAR SALAD (Php 360) – Fresh bacon, six minute egg, and shaved parmesean cheese. A simple and refreshing salad. It helped balance the strong flavors of the soup and steaks. 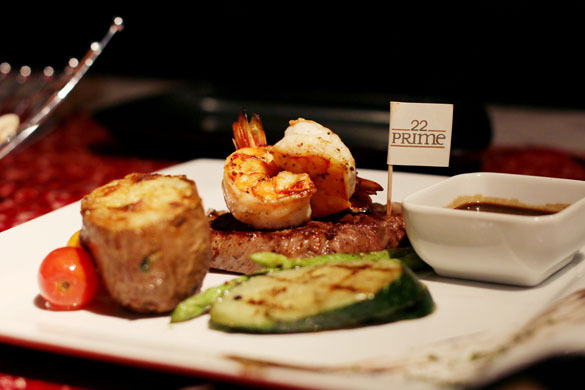 SURF N TURF (Php 1,450) – Grilled Angus ribeye steak, jumbo prawns, twice baked potato, and grilled asparagus, zucchini, and cherry tomatoes. The 200-gram Angus steak was perfectly tender and juicy. It had a tangy gravy on the side, but even without it, it was already full of flavor. I just hoped that the steak and prawns were bigger though. But overall, it was a delicious dish. You can never go wrong with ordering steak and seafood. Well, for me, at least. It’s one of my favorite combinations! 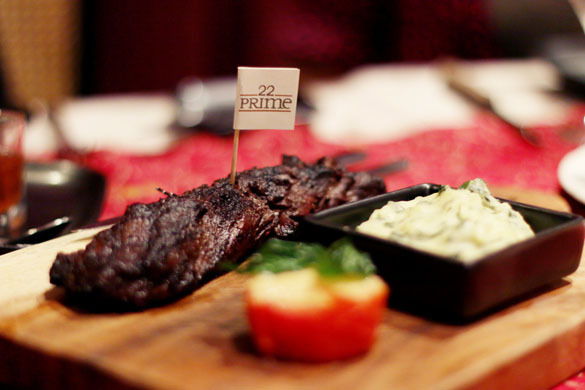 WAGYU HANGER STEAK (Php 950) – 200-gram grilled hanger steak, baked tomato, and herb mashed potatoes. I like how the steak was perfectly grilled without having any hint of bitterness. Even if it had charred marks, it was delicious, juicy, tender, and flavorful. How did they do it? Haha! The mashed potatoes also complemented the steak well. It had the right amount of salt, butter, cream, and herbs. 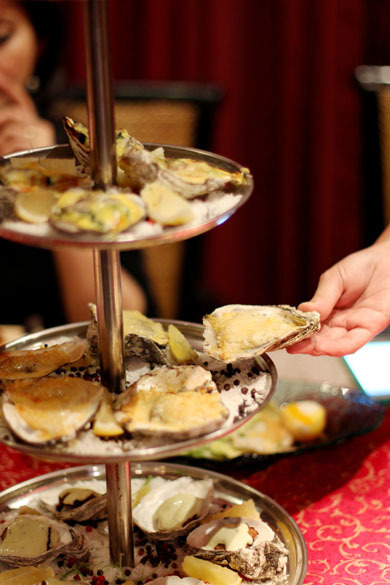 OYSTERS PLATEAU (Php 1,200) – A tower of oysters served with a cocktail sauce, mignonette, and horseradish cream. THIS DISH WAS THE HIGHLIGHT OF THE NIGHT. We made sure to order oysters because we were celebrating the pearl anniversary of our parents. 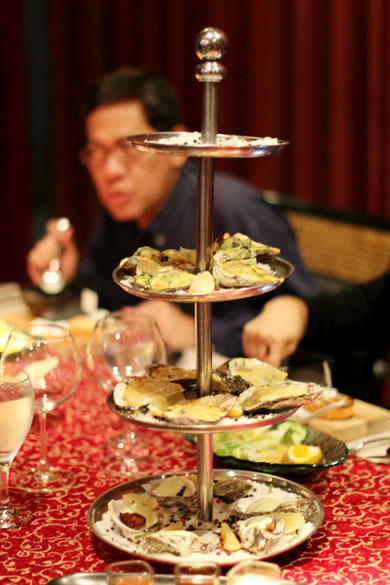 :) Aside from its lovely presentation, this tower had 3 kinds of oysters (broiled, baked, and Rockefeller) which was perfect for our family since we have different taste preferences. 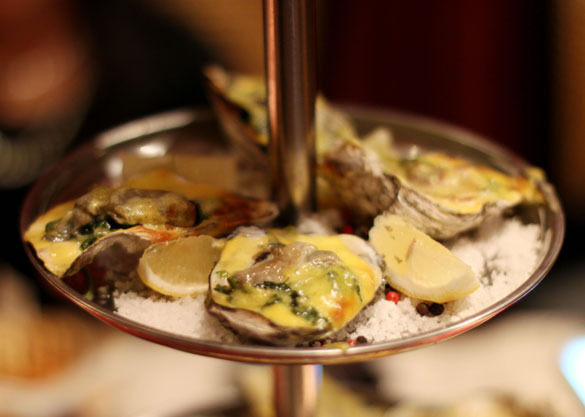 My personal favorite is the classic oysters Rockefeller (with lemon juice squeezed over them). My other siblings liked the cheesy baked and broiled oysters more. 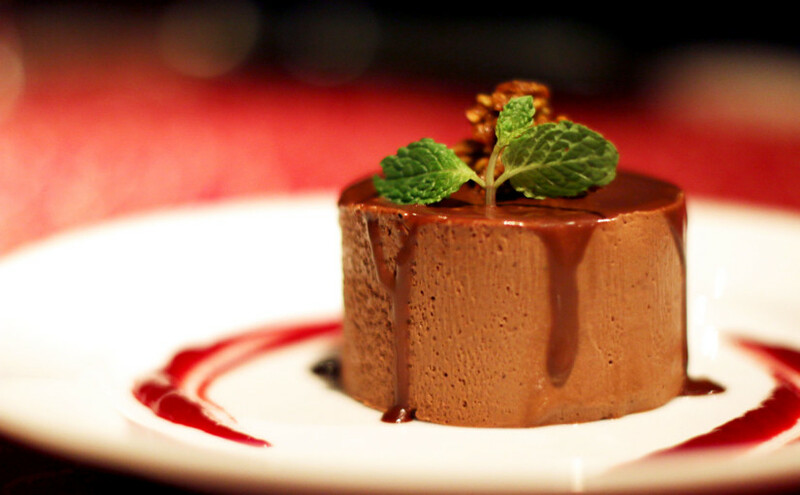 CHOCOLATE GODDESS (Php 360) – Double chocolate mousse, melted dark chocolate, topped with candied pistachios. This dessert was amazing. Even after two weeks, I still remember how rich the chocolate flavor was. It also had a smooth texture which was very delectable. 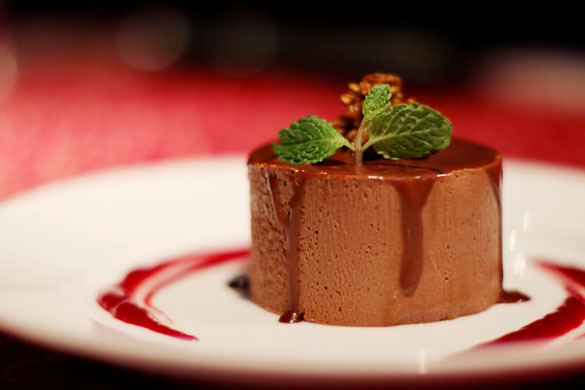 When I go back to Prime 22, I wouldn’t mind ordering this dessert again. Before we left the place, the staff and waiters of Prime 22 were gracious enough to help us surprise our parents one last time that evening. 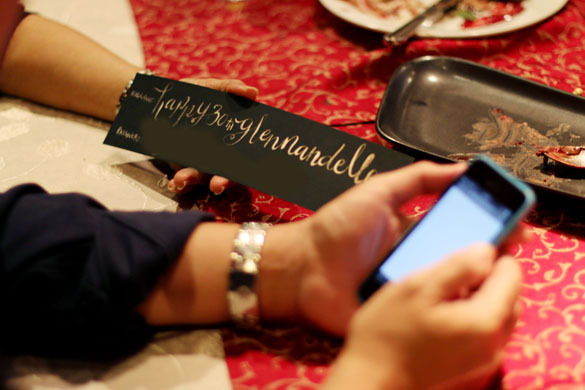 Just before serving our dessert, they brought in a complimentary slice of chocolate cake with a dedication (made out of chocolate ganache) written on the plate. They also brought out the bouquet of flowers that we bought for mom earlier that day. Yay! 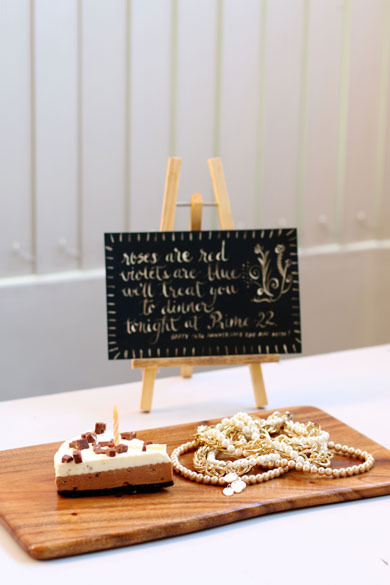 Thank you, Prime 22, for the special treat! 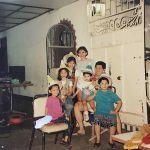 As we were on our way out, our dad shared that his heart was so full and overwhelmed because of the love and grace they experienced that day through the surprise gifts and greetings. It was also a very encouraging experience for the whole family and we can only thank God for this privilege and for His grace. 22nd floor, Discovery Suites, 25 ADB Avenue, Ortigas Center Pasig City. For reservations, call 7196822 or 7198888.